Our range of products include concrete power trowel. 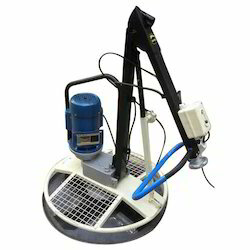 The Concrete Power Trowel with electric motor is a high efficiency, light weight machine for floating & troweling concrete surface. the machine can be operated at two speeds 115 and 57 R.P.M. to obtain the desired output. This machine is provided with two types of finishing tools. A disc for floating and a set of four bleds for troweling. to obtain fine finish the blade angle should be control. Output shaft speed 115/ 57 r.p.m. Looking for Concrete Power Trowel ?